Jim Kerr was born in March 1942. He joined Queen of the South for season 1959/60 from Kello Rovers and ended his Palmerston career with season 1970/71. Kerr made 403 QoS first team appearances – sixth highest in Queen history. A former Queens Captain, he also chipped in with 14 goals. On leaving Queens he went back again to Kello. With his QoS career spanning the decade, Kerr could be looked upon as the Mr Queens of the 1960s. Hailing from Kirkconnel (like another Queens Legend, Willie Ferguson), before moving to Sanquhar, Queens can feel fortunate to have enjoyed his services. Clubs in England were interested in signing Kerr but as a home loving guy, signed up at Palmerston because it would be handier for him. Kerr’s debut was aged 18 in a late season 4-0 away win at Cowdenbeath on 30th April 1960, a season when Queens ended up in third missing promotion by one place. This was something of a taste of things to come for Kerr as this was the most common league finish in Kerr’s time at Queens - it happened on four occasions. In Kerr’s first season the promotion challenge boiled down to a crunch game against promotion rivals Dundee United two weeks before Kerr’s debut. A high scoring game at Tannadice earlier in the season had produced a 4-3 home win. The game at Palmerston produced more goals but the 4-4 scoreline failed to produce the win Queens needed. The Tannadice club ended the season a point higher of the two clubs. 60/61 was less impressive in the league finishing fifth. There was though a run to the semi finals of the League Cup. Maurice Elliott took the plaudits for his attacking play as Queens won all six games of their group. The two legged quarter final paired Queens with Dumbarton. Despite QoS dominating, the 2-0 win to take to Boghead hardly rendered the contest over. In the return Dumbarton were two 2-1 up (Bobby Black scoring for Queens), and piling an onslaught on the Doonhamers defence in the last 15 minutes. It was Kerr though who took the spotlight away from the forwards with his dying seconds clearance from all but on the goal line taking Queens through to the semi (a heavy defeat to Rangers). In 1962 George Farm’s role was expanded from player to player manager to replace who is still the most successful Queens manager in history, Jimmy McKinnell junior. Having been able to study opposing players from the same division from his position on the pitch, Farm had a good idea of which of his opponents that he would like to add to his playing staff. Two players of note joined from Alloa. Willie McLean was a left winger in his playing days. He started at Airdrie from where he earned a move to Sheffield Wednesday. Unable to break through to the Hillsborough first team, he returned to Scotland and in his one season with Alloa hit an impressive 18 goals from 34 league games. The man who enjoyed the most success of any Queens player from the 60s was another attacker signed from Alloa, future Scotland centre forward Neil Martin. John Rugg was a tall centre back signed from Berwick Rangers to join Kerr in defence for three seasons before moving to Durban in South Africa. Another addition was solidly built full back, John McTurk, dropping down a division from St Mirren. The newcomers added to a playing staff that already contained some talented players; Kerr, player manager Farm and Ernie Hannigan who like Martin was destined for England’s top flight. The young Iain McChesney broke into the Palmerston first team near the season’s end and at the experienced end of his playing career, Jim Patterson was to prove he still knew where the goal was. Queens started the season impressively with a 5-0 home hiding of Brechin City. No surprises that Queens’ best results were at Palmerston with a couple of 4-1 home wins (against Stenhousemuir and Dumbarton) thrown in before Patterson’s six goal contribution to the 7-1 win against Cowdenbeath in December. Indeed before New Year, Hamilton Accies were the only team to get the better of Kerr and his team mates sufficiently to return home with a league win in Dumfries so far that season (Accies won by the only goal). A New Year’s Day 3-0 win away at south west rivals Stranraer kept Queens on top spot. Kerr, Rugg, Farm and their defensive team mates were the least generous in the division. They ended the season with 14 goals against less than any other team (the attack in comparison were equal fourth highest scorers with two other teams), providing the bed rock of that season’s success. The championship developed into a two horse race for the title with Queens clinching promotion with games to spare. “We played up there and I think Clyde were winning 1-0 and I ran through on goals but put it past the post. If I’d scored it would have been the equaliser. We beat them 3-0 in the second game and we finished second”. 3-0 doesn’t tell the whole story with Clyde taking a real horsing and 82 minutes passing before Farm made his first save. While the self critical McChesney laments the missed chance, it wasn’t the only moment rued by Queens during the game. Patterson had a goal disallowed eight minutes after Clyde scored with a penalty correctly awarded for hand ball against McTurk. Many Queens fans will remember the 85/86 season when after beating championship rivals Dunfermline at home, Nobby Clark’s team tapered off in form for the rest of the run in to allow the Fife side to surpass Queens in the title race. A season of commendable achievement had a feeling of some disappointment with a golden title opportunity lost. This was similar to the disappointment of ‘62 when the difference of one goal in the 1st of the games against Clyde was the difference between promotion as champions and runners up. At the same time though the season still had to be looked upon as a success. A return to the top flight had been achieved after an absence of three seasons. The irony of running up to Clyde didn’t end there though – midway through the season after Willie McLean left to join his brother Jim who was in his fourth season there. Both later went into management as did their younger brother Tommy. Willie enjoyed some excellent results managing Queens in the 70s to a divisional runners up spot. Kerr spent two seasons in Scotland’s top division with Queens marking their return with a 2-1 away win against Bobby Ancell’s Motherwell (McLean and Martin scored). In Queens first season back the most eye catching result was as had so often been the case since Queens first joined the top flight in 1933 – a win against Celtic, this time in November 1962. Celtic in the early 60s were a shadow of the consistent European contenders they would become from Jock Stein’s appointment in March ’65 but any win against either of the Old Firm? It isn’t something to be sniffed at. Queens went ahead in the 42nd minute after Jim Kennedy used his arm to stop a goal from a John Murphy shot. Murphy himself put away the penalty to give Queens a deserved away lead. For the last 30 minutes Celtic finally took the game to Queens. The defence though was resilient with Farm in particular having a good game as well as a player chalking up a win on what was the home ground of his father, Queens’ Willie Morrison. Murphy’s goal decided the game. One press headline reported, “Never-say-die Queens shock ‘Lost’ Celtic”. After having had an excellent record over three decades against the Parkhead side clocking up win after win, Queens have not again recorded a victory against Celtic in a competitive fixture up to the time of publishing of this article (April 2012). It was home results that were the spine of Queens successful battle for survival. Aberdeen were among those vanquished at Palmerston as were Dundee United. The reigning champs, the excellent Dundee side of the era, were beaten 1-0 to give some redress for the 10-2 disaster at Dens when George Farm had to leave the game early in the proceedings. The biggest QoS win was against Raith Rovers. In their first season post their Wilie McNaught era Raith endured a nightmare ending up well bottom with only nine points. When they played at Palmerston Queens beat them 5-1. In a reverse of the fortunes of the 62 promotion season, Clyde were the side to take the drop along with Rovers to give an ironic twist to McLean’s decision to have switched to the then Rutherglen club. Thus QoS stayed up finishing two places above the drop zone (Hibs were one place below Queens). Further credibility was added to the season by reaching the quarter finals of both cup competitions (this was the year of the epic quarter final against Dundee United where the Tannadice club went through after two replays). The season after was a different tale with Queens enduring the relegation nightmare. With the considerable presence of Neil Martin now at Hibs, Queens gathered only 16 points to finish second bottom. Kerr and indeed McChesney were joined by some new players who were to be long servants. Allan Ball had joined in the second season back in the top flight. 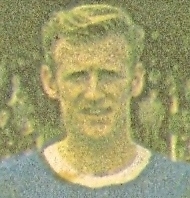 Billy Collings gave fine service for six seasons after joining in the ‘64 close season. Two siblings gave rise to the status of a mini football dynasty at Palmerston. Jackie Law jr was there and soon joined by his brother Lex (Jackie sr had played for Queens in the 30s and 40s). Kerr and his team mates contested promotion for both seasons immediately after the return to the second division on each occasion missing out by one place. The team of the 60s had peaked though and after the results of the side dropping for a number of seasons, Kerr was in a promotion contest one last time, season 69/70 but again missed out by one spot with a third place finish. “The one I probably remember most of Jim was the Scottish cup tie when we played Clydebank [6th January 1968]. We drew at Palmerston on the Saturday [2-2] and then we played on the Wednesday [17th January] the replay and drew [2-2] again. Because of the fixtures, there was a pile up, we had to play on the Thursday night [18th January] as well and Jim scored the winning goal. I think it was a shot if I remember it rightly which was unusual because Jim wasn’t usually that far up the park”, chuckled a cheerful McChesney. 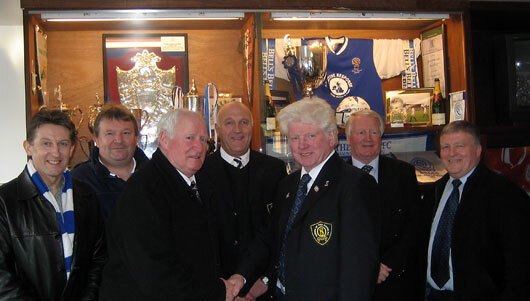 Four Queen of the South ’legends’ came together for the first time in years on Saturday [16 Feb 2008]. 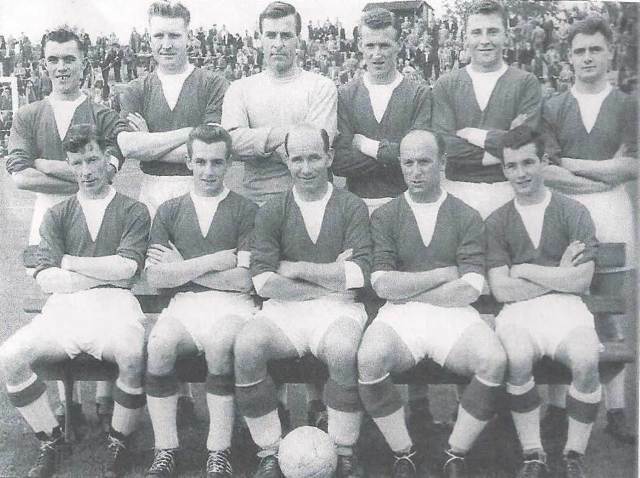 Allan Ball, Jim Kerr, Lex Law and Billy Collings all played in the same team during the 1960s and were joined at Palmerston by Iain Mitchell and Ian White who played in the late 1970’s. Those four stalwarts amassed an amazing total of 1713 appearances during their years of loyal service to the club and for Jim Kerr it was a memorable afternoon as he hadn’t met his former team-mates for ages. Allan Ball himself notched up a club record of 731 starts (819 if challenge matches and friendly games were included) and he is now an Honorary Director. Jim Kerr, who hails from Sanquhar, played 403 games, Lex Law 332 with Billy Collings turning out 247 times. Iain Mitchell and Ian White also come from Sanquhar and were proud to accompany Jim down to the game. Apart from football ’Mitch’s’ other claim to fame was being Cornet in the burgh’s annual Riding of the Marches. They must have brought us luck as we won 3-1 [against Stirling Albion]. (Chairman, David Rae, welcomes Jim Kerr to the Palmerston Boardroom. Looking on are, left to right, Iain Mitchell, Ian White, Allan Ball, Billy Collings and Lex Law). Said elder statesman, Jim Kerr, "I hadn’t set foot in Palmerston for years but, after Saturday’s experience, I’m hoping to be down again. It was lovely being back and meeting up again with so many old friends and acquaintances. I’m indebted to Ian Turnbull for driving me there and back and although I was a wee bit worried about all the steps I managed OK. It was great to see Allan Ball, Billy Collings and Lex Law again and my two Sanquhar pals, ’Mitch’ and ’Whitey’ kept an eye on me. On the way home we stopped for a fish supper in the Palmerston Cafe just as we used to do when I was playing". Excellent work by the Sanquhar QoS Supporters Club to arrange Kerr’s return to Palmerston. It was not long after when sombre news on Kerr at the age of 66 was reported. It’s with great sadness that we report the death of Jim Kerr who died at his home in Sanquhar yesterday [Sat 8 Nov 2008]. Jim joined Queens from his local side, Kello Rovers, in 1959 and was at Palmerston for over 12 years. He turned out at both right-back and centre-half and made 403 first team appearances - the sixth highest in the history of the club. Chairman, David Rae, described him as, "A clean-cut whole hearted clubman, a tremendous competitor and a gentleman in every sense of the word. He was down at Palmerston only last season for a visit and thoroughly enjoyed himself”. "There were a lot of English players at Palmerston at the time and they all thought the world of Jim - especially Mike Barker who will be devastated to hear of his death. He really enjoyed his football and was always good for a song on the way home from away matches". There will also be a minute’s silence at the next Queens home game, against Clyde on November 22. Then on the QoS website was news of a fitting tribute to a fine player and every inch a local hero. The Sanquhar branch of the Queen of the South Supporters’ Club have decided to re-name their annual ’Player of the Year’ trophy this season. It will now be called the Jim Kerr Memorial Trophy in memory of the Queens’ legend who passed away last year. Said branch secretary Ian Turnbull, "That’s the plan at the moment but we might even purchase a new trophy as a mark of respect for Jim who was loved by all. "It has also been brought to my attention that the Rangers and Celtic Supporters Clubs in the Sanquhar area are setting up fundraising themselves to purchase a suitable memorial to him as well, and that speaks volumes for Jim’s popularity". One of the age group teams at Queens were sponsored by the Sanquhar Supporters Club for a season in Kerr’s honour. There is a memorial seat at Sanquhar Golf Club in Kerr’s memory arranged by other members of the club where Kerr played. The Sanquhar supporters club have commissioned a plaque to be displayed at Palmerston in recognition of the 403 QoS games Kerr played over 12 years.